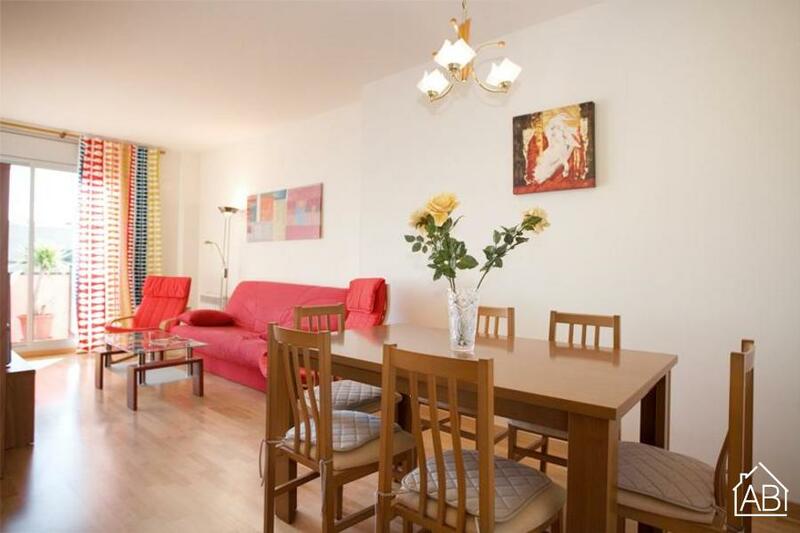 This spacious three-bedroom apartment in Barcelona, located in the beautiful Poblenou neighborhood, is a wonderful choice for those making their way to the Catalan capital. With the majestic Parc de la Ciutadella on the one side and the mesmerizing Mediterranean Sea on the other, you will enjoy easy access to some of Barcelona´s best spots from this stylish apartment. And with historic downtown not far away on foot or public transport, the city will be at your fingertips! This lovely apartment comes complete with two swimming pools, one for adults and the other for children, and can accommodate up to 9 people in total. Guests are sure to feel right at home in this apartment as the modish parquet flooring and large windows add to the roomy feel of this lovely locale. The living room has a TV, perfect for unwinding after a day of sightseeing. Access to a balcony offers views of the surrounding area and is sure to satisfy those looking to soak up some Spanish sun. An Internet connection is also available making it easy to stay in touch with friends and family back home. The modern kitchen is fully equipped allowing visitors to create their favorite home-cooked meals, all in the privacy and comfort of this charming apartment. There are 5 single beds and one double distributed throughout the apartment. In the lounge there is a sofa bed and pull-out bed. The apartment has two bathrooms. All linens and towels will be provided for your stay. This welcoming apartment, complete with heating and air-conditioning in each bedroom, is the ideal base for your trip to Barcelona, and ensures a comfortable stay any time of the year! There is an optional parking space available for 15 Euros per day, subject to availability. حي البوبلا نو La Poble Nou ( الحي الجديد) يحده البحر المتوسط من جانب وحديقة سيوتاديلا من الجانب الأخر. كان واحد من المناطق الصناعية ببرشلونة إلى أن تم تجديده في العقود الأخيرة وخلق أحياء أخرى مثل فيلا أوليمبيكLa vila Olimpica، مسكن الرياضين المشاركين بالألعاب الأوليمبية عام 1992، وديغونال مار. بالإضافة إلى قرب الحي من الشواطئ والتغيير الشامل، جذب العديد من الفنانين والشباب للإقامة فيه. ويعتبر شارع رمبلا دي بوبل نوRambla del Poble nou من الشوارع الرئيسية التي لا تهدئ والملئ بالمطاعم والبارات وجو عام رائع. تتوسط حديقة الفورم حي ديغونال مار الجديد، حيث يعقد العديد من المؤتمرات والمهرجانات والحفلات الغنائية. إذا أخترت شقة ببوبل نو تأكد أنك ستستمتع بإقامة رائعة بالقرب من الشواطئ مع خطوط مواصلات عامة للذهاب لوسط المدينة بسهولة.